Well it sure has cooled down a bit here in San Diego.......so nice we decided to do some grilling. Well make that the Missus decided I needed to do some grilling. 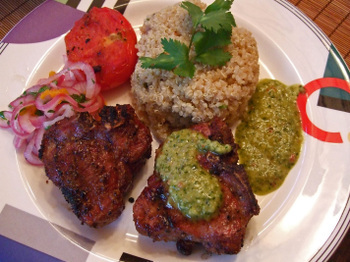 And wanted, "something different, and good for a change....."
I went for sort of a South American theme, Quinoa Pilaf, with grilled (cheapo) Lamb Loin Chops with Chimichurri and Salza Criolla, and grilled tomato. It came out much better than I thought it would, the Salsa Criolla, tasted exactly like the versions I've had in restaurants, and the Missus loved the Chimichurri as well. From what I understand, this popular South American sauce and marinade originated in Argentina, and in its most basic form consists of only 4 ingredients, parsley, garlic, olive oil, and salt, though you'll find that no two recipes are alike. The version here is the base version with some adjustments adding ingredients we enjoy; garlic, onion, cilantro, and other stuff. As with most everything I cook, it is quite easy to make. Don't be afraid of the amount of garlic.....really! 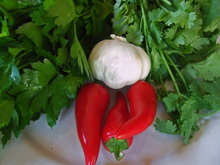 Combine parsley, cilantro, garlic, onion, and jalapeno in a food processor, pulsing to chop fine. Add oregano, brown sugar, and vinegar, and with processor going, add olive oil. Refrigerate for about an hour to allow flavors to meld. You can use as a sauce or marinade. 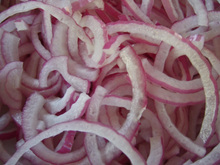 Add 1/2 tsp Salt to red onion slices and let rest for 5-10 minutes. Rinse onion and drain well. Mix all ingredients. 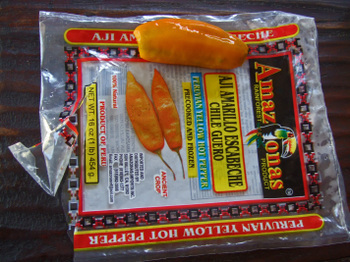 We enjoy our Salza Criolla nice and cold, so we refrigerate for a few minutes before serving. Last weekend we were driving up Convoy, and noticed that newspapers were taped over the windows at Jamillah Garden. I drove into the parking lot and walked into the restaurant where tables were being disassembled. I asked the Young Man if Jamillah Garden was being renovated, or were they closing. His answer? "We are permanently closed." 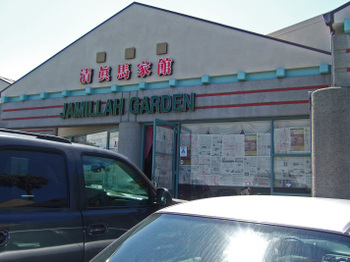 Too bad.....the food was somewhat inconsistent, but Jamillah Garden was the only Muslim Chinese Restaurant in San Diego. Previous posts on Jamillah Garden here and here. Oh no! I liked Jamillah Garden! To be fair, I haven't been back there in a while, but I did like it. :( Thanks for the update! But you did call it piquant! :) I love chimichurri. The Brazilian version I had at Fogo de Chao had some kind of cream so it's thicker and pink, but still tasty. Last time i went to Jamillah Garden we were the only people there at 6:30pm. I just might drop by. That's funny. 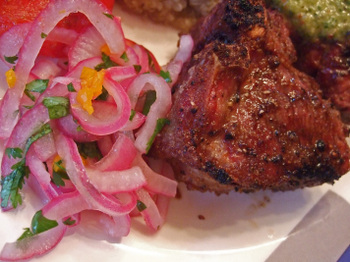 I just made lamb with chimichurri last night for my cooking club. What is it they say about great minds? :-) Yours sounds much better though, probably because you added a whole head of garlic. Hi Kirk - What time did you say dinner was again? Wow, Kirk. I think you and the Missus might need to consider writing your own cookbook. Your meal looks delicious! 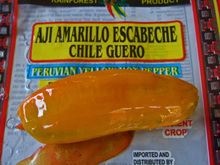 Kirk, where did you buy the aji amarillo? I'd love to get my hands on some and do some experimentation in the kitchen. I had fantastic Aji de Gallina at Latin Chef, and was inspired. Hi Clayfu - We did find Jamillah Garden to be somewhat inconsistant, but it was still a nice change of pace. Hi RONW - LOL! No need for a restaurant.....these are easy to make at home. Hi Michael - You can just do it at home...it'll probably come out even better! Hi Carol - Thanks for the kind words....but I usually make only simple stuff. Sweet! 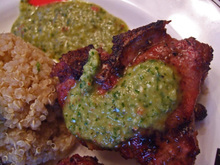 I love chimichurri! Goes great on everything, even ice cream. I'm not kidding, although alcohol and money were definitely involved when I tried that particular combination. The Jamillah Garden location now has a banner: CrawDaddys. Anyone want to bet it will be a Vietnamese-Cajun restaurant? Hi Sandy - Yes, I saw it and have a photo...just waiting to have enough stuff to do a "stuffs" post. This is the competition for CrabHut that Yummy Yummy mentioned. 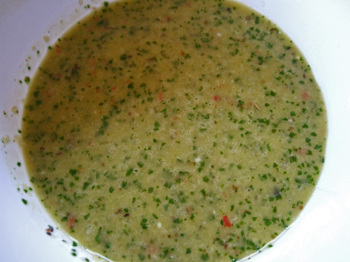 Ok for everyones education Chimichurri is argentinean BBQ sauce/marinade the base is garlic(Lots), parsley, olive oil, vinegar, oregano, and chile flake. everything else u add just messes with the true flavors and by the way SALSA Criolla is Argentinean as well since Peru has no Creoles !!!!!!!!! Hi Gaucho - For your education.... - I mentioned in the post that Chimmichurri originated in Argentina - though there is a story that it was created by an Irishman. 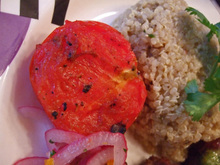 Salsa Criolla - aka Salsa Cebolla is very popular in Peru, we had it there, that's what they call it. Calling it Argentinian BBQ sauce dimishes it's importance. In Peru they consider the mix of Spanish and the indigenous people "creole". Hey, read things once in a while ok? How long have you lived in San Diego? CA has appx 45 million people of which 20 million are Latino. I wonder why the only "Muslim Chinese" restaurant closed??? Hi Ant - Congrats, you win the troll of the day award! You know, we have four decent Sichuan Restaurants. Islamic Chinese restaurants do really well in LA in spite of the numbers. This place just never hit stride; they had a pretty successful location in OC. I guess San Diego wasn't ready. I've lived in San Diego for over ten years.